Nisekoi reads like a “cliché romance-comedy anime” checklist: A harem of girls? Check. A long lost childhood love? Check. Characters who hate each other falling in love? Check. An endless cycle of “will they won't they?” Check. All in all, it embodies the very essence of a modern rom-com anime. Nisekoi is a series built on two common Japanese romance plot setups. The first of these is the “long lost childhood love” premise. When the male lead, Raku, was a young boy, he spent a summer playing with a girl. At the end of their time together, they promised to marry when they grew up. To signify the promise, the girl gave Raku a locket which can only be opened with the key she kept. By the time of the series, he has yet to meet her again and can't even remember her name or face—despite still wearing the locket everyday. Of course, that doesn't mean there isn't a mysterious key or two being held on to by the girls around him. The other setup is one of two people who hate each other forced into a situation where they must pretend to be lovers. 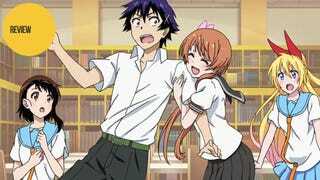 In this case, Raku (who is the heir of a yakuza family, by the way) is forced to go out with Chitoge, the daughter of a rival family, to prevent all-out gang warfare between their families. As their fathers put it, the only thing able to stop the gangs' hatred for each other is the romantic tale of star-crossed lovers. Of course, these two plot setups don't exactly coincide peacefully—which is largely the point. A lot of the good fun in Nisekoi comes from these two common romance plots colliding in comical ways. Moreover, the constant swapping between the two plots serves to add more than a little variety to the overall story as well as keep the anime moving at a good pace. There are four romantic foils for Raku in the series: Chitoge, Kosaki, Tsugumi, and Marika. Each of them embodies one of the four common female character types seen in anime and manga. Chitoge is your classic tsundere—always fighting with Raku as she is unable to properly express her inner, loving emotions. Kosaki is a dandere—the typical shy girl that only really opens up around good friends and the guy she likes. Tsugumi is a kuudere—cool, calm, collected (and completely badass) but is at a total loss about what to do with her newfound feelings of love. Lastly, Marika is a yandere (though a seemingly non-violent one)—obsessed with having the boy of her dreams to the point of completely reinventing her appearance and personality to appeal to him. Even little things like Raku not knowing who she is or his having a girlfriend are minor obstacles to her and her decade-long obsession. While there is nothing innately wrong with utilizing these personality types in an anime as they make the characters distinct from one another, there is a downside to using them as well: Once you realize that each girl embodies one of these character stereotypes, it’s easy to guess how each of them will act in practically any given situation. Character interactions pretty much write themselves, making the series more than a little predictable. As is par for the course with many romance anime, Nisekoi is a show that is set in a permanent holding pattern of “who will our hero choose.” Nearly every episode tries to convince you that it's building up to something major happening—e.g., a confession of love or a secret revealed. But of course, this never pays off. Either the character wusses out at the last second or a random event outside of everyone’s control interrupts the supposed big reveal—fate (read: the writer) takes an active role in stringing the viewer along each week. This would be unbearable if it weren't for the fact that major events do happen. They are never telegraphed—so much so they often surprise all parties involved including the speaker—and they thus give a measure of unpredictability to the anime that saves it from being completely predictable. Unfortunately, not a single revealed secret or heartfelt confession in the whole series does much to shake the status quo. This is because, when it comes down to it, they are all nothing but a series of red herrings. It doesn’t matter who knows what or who likes who. It doesn't even matter who the girl was he promised to marry all those years ago. Nothing is going to change—nothing can change—as long as the original problem exists. If Raku and Chitoge don't convincingly pretend to go out, everything breaks down into bloody gang warfare. Even if the girls involved were selfish enough to let people die for the sake of their teenage hormones (which they are not), Raku would never be on board. Thus, until that problem is resolved, the story can never progress in any meaningful way. Nisekoi isn't particularly fresh or new in what it delivers. It's a harem love story with stereotypical characters in cliché high school situations. It goes nowhere and is happy enough to play around spinning its wheels. However, despite this, it does manage to stay engaging throughout. The characters are enjoyable (though predictable) and you'll likely become more than a little invested in the girl of your choice as the show progresses. After all, let us not forget there is a reason that clichés become clichés in the first place: They affect us in a way that makes us want to see them again and again—until we get sick of them, at least. And if nothing else, Nisekoi made me remember why I liked these character types in the first place. Nisekoi aired on Tokyo MX in Japan. It is available for free and with English subtitles in the United States on Crunchyroll, Daisuki, and Hulu.